We’re over half way through final term, which can only mean one thing… EXTRAVVVVVVV! DO YOU WANT FREE TICKETS TO EXTRAV? Here’s what you have to do… We have 4 bedsheets across campus with the ЯR logo and you need to get a photo of you with each of the bedsheets and send it to us at @furnesscollege on snapchat! (You have to be in the photo with the bedsheets for it to count!) Once we have received all 4 images of you with our 4 different bedsheets, you will be entered into a prize draw! The winner will be released along with our theme on Saturday 28th! We hope that everyone had a fantastic day yesterday at the Richard Slatter memorial tournament, we certainly did! Here‘s some photos that were taken on the day. We’d also like to give a special congratulations to Dom Kay who was the winner of this year’s tournament! See you all next year! It’s been too long since the 15 Hour Bar Crawl so our socials team thought they’d treat you to another bar crawl! On Friday of Week 7 we’re going to be dressing up in our sunniest attire and taking the campus bars by storm! Come to Trev at 7pm where we’ll be starting the bar crawl in style. Prizes will be awarded for best dressed, so make sure you don your snazziest sunglasses, Hawaiian shirts and swim shorts! Want to be on the JCR? Do you want to make a difference to your college? Considering running for a position in LUSU but not 100% sure if it’s for you? Just need something to pad out your CV? Here’s your chance! There are 3 positions up for grabs at the end of this term! Here’s the positions and who to contact if you have any questions, or simply just want to chat! Do you miss school sports day? Want a wave of nostalgia? Come along to the sports hall on Wednesday Week 28 and represent Furness! Head on down to the TV room on Monday at 10am to have some tea and biscuits and start off your week right! This week the “We ♥ Trev Wednesday” Pub Quiz is back again! As you may know, the pub quiz will only take every other week this term due to pesky exams and coursework deadlines, but there’s still all to play for! For the teeny price of £1 you can earn yourself a chance of getting on this term’s leaderboard to win a bonus cash prize at the end of term, as well as the usual cash prize for first and second place. This week’s specialist topic is Marvel Films, so brush up on your knowledge and come to Trev at 7:30pm on Wednesday! Here’s the event. Set a stop-watch on your browser or phone for ten minutes. Prepare yourself to work as hard as possible, but for ten minutes only. Once the ten minutes is up, you don’t have to work anymore. The hardest part is getting started, and often once you’re in the zone and the alarm rings you’re focused, so you can reset it and keep going for another ten minutes. At the point when you’ve reset it but find your mind wondering, that’s your natural time to take a break. Get a pad of post-it notes. Every time a distracting thought wanders through your mind – WRITE IT DOWN! Once you get to an appropriate break in your revision take a break and read through the post-it notes. Often what seems urgent or important mid-paragraph is actually neither. And if it is important – then now is the time to do it. That way you give mind body and soul a rest. They are only exams, everyone is in the same position and you are not alone! That’s all for this week Furness! Hope everyone has a great week! Don’t worry! Every Monday at 10am come to Furness TV Room for 10 minutes of relaxation and preparation to start your week right. We’ll be providing free tea/coffee/drinks/biscuits as well as study tips to make sure you’re on top of your revision and ready for the exam season! Remember, if you have any welfare issues then you can always contact furnesscat@lancaster.ac.uk to get in touch with our team of qualified college advisors, or get in touch with one of our welfare officers! Fish & Chips, Boat, Quiz, Prizes… what more could you want?! 15th June 2016 – Departing at 7:00pm returning 9:40pm. We’re hiring the Kingfisher boat for an evening cruise along the Lancaster Canal. You’ll be served award winning fish and chips, and there’ll be a quiz where you can win prizes! Don’t worry, drinks will be available to purchase on the boat! WANT £150 TO TRAVEL THE WORLD THIS SUMMER? If you are planning any non-course-related travel over the summer vacation, which will enhance your life experience, you may be eligible for a Vacation Travel Award of up to £150! You must produce a short report with pictures of your trip on your return and the best report will be awarded a further £200 from the Paddon fund. To apply, contact Bev Whitaker. The closing date is Friday 27th May. Go for it Furness! Are you going to do Postgraduate Study at Lancaster? 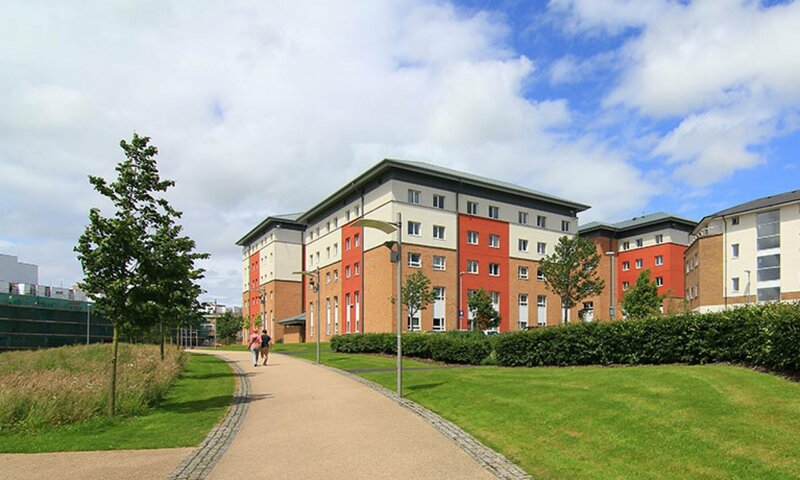 Do you want to stay in Furness in the middle of campus rather than have to trek from South West? Then we have a job for you… Assistant Dean! Furness requires one position for the coming year. The amount of time for this post is no more than 10 hours per week (and in Furness is usually less). You will become a member of the SCR and College Team, and remuneration for this role is in the form of payment towards your on campus accommodation, which will be in Furness College. The deadline for applications is noon on 23rd May 2016 and interviews will take place week commencing 6th June 2016. The Pub Quiz is back next week! Next week’s specialist round is Marvel films, so brush up on your knowledge to have the best chance of winning! On Wednesday at 7:30pm come and take part in the beloved pub quiz in our college bar, Trev, for the teeny price of £1 per player. As well as cash prizes up for grabs, you can also get your team onto this terms leaderboard to get a bonus prize at the end of term. That’s all for this week! I hope everyone has a great week and gets through their exams fast enough to enjoy summer! We hope that everyone has had a great Bank Holiday and that revision isn’t taking too much of a toll! Apparently we are forecast a heat wave at the end of this week, so we fully expect to see all of you out on the grass at some point! Firstly, we’d like to congratulate everyone that competed in Roses! WE WONNNNNNN! Below you can see some of the Furnessians who represented Lancaster to our glorious victory! LUSU are planning big changes to your union – but need your support to make them happen. Next week all students will get to vote on whether we move to a new structure designed to put more power in your hands. The vote will take place at our AGM in George Fox Lecture Theatre 1 at 6pm on Thursday May 5. You can vote at the meeting or submit an online proxy vote. If you wish to proxy vote please follow the instructions emailed to you. (If you have not received the email on Friday 29th April please email elections@lusu.co.uk with you library card number.) More information here. Feeling stressed about exams? Don’t worry! Every Monday at 10am come to Furness TV Room for 10 minutes of relaxtion and preparation to start your week right. We’ll be providing free tea/coffe/drinks/biscuits as well as study tips to make sure you’re on top of your revision and ready for the exam season! The Pub Quiz isn’t on this week, so you’ll have a week to prep yourselves for the specialist topic which is…. Memes! Here’s your up to date leaderboard – Props goes to some of the teams for their imaginative team names! And that’s everything for this week! We hope everyone has a great week! We hope that everyone had a fantastic Easter and aren’t dreading exams too much! Don’t worry! Every Monday at 10am come to Furness TV Room for 10 minutes of relaxtion and preparation to start your week right. We’ll be providing free tea/coffe/drinks/biscuits as well as study tips to make sure you’re on top of your revision and ready for the exam season! More information available on the Facebook Page. More information will be released closer to the time, so keep your eyes peeled and feel free to get in touch with any questions you may have! Don’t fear, we would never let exams get in the way of us having our amazing pub quiz <3 This term the Pub Quiz will be fortnightly, starting next week (Week 22). This just gives you extra time to brush up on your general knowledge in and around revision! Just play are doing a Couch-to-5km challenge that you can take part in for FREE! More information available on their Facebook Page. The Careers team will be delivering sessions for Furness and Fylde colleges. More information can be found here. In celebration of St George’s day the World at Lancaster is hosting the ‘Great British Tea Party’ on Friday the 22nd of April from 2pm in Alexandra square. Join us to celebrate this English heritage event whilst enjoying a traditional afternoon tea with sandwiches, cakes and most importantly tea! Lonsdale Bar is hosting a Cross Campus event with Captain Morgan as part of their Feel Fresh week! We’re sure you saw them with all their goodies and prizes in Sugar at the end of last term! Lonsdale’s very own will be DJ’ing with our usual Matty Allen (Tabuki) and Matt Ferris (Luedms) taking to the decks, as well as two newcomers Jordan Hodgson and Tom Birchall making their debut. Everyone from all Colleges is welcome, so invite your friends and get down to Lonnie for a night off and to dance your stress away!! More information available on their Facebook Page. That’s all for now everyone, I hope that everyone has a great week! Happy Monday Furness! It’s been a pretty hectic week, with plenty more to come! Unfortunately, due to some expected cheating from Cartmel, the final score (and who won) is still under debate! Some photos from the day will be uploaded to our Facebook page, keep an eye out for them and get tagging when they go up! Thank you to all applicants who attended their interviews this week. You can expect to hear a decision regarding your application during the Easter holiday (due to the overwhelming applicants to position ratio). Furness won the first round, as Cartmel were too scared to even send a team! Unfortunately Bowland were too great a competition and we unfortunately came up short 🙁 Here’s a picture of our lovely team! This Tuesday is the last day to get your applicants in, make sure you email e.mccann@lancaster.ac.uk to get your application in. The grand prize is an office space in Furness – and for eligibility, all you have to have is a business idea of some kind – you don’t even have to be in Furness, so if any of your friends have a business idea then tell them to get in touch! Check out the Facebook page for more details! Many of you will have seen our first ever ‘Where’s Terry’ on Facebook on Friday. If you couldn’t find Terry – here’s the solution to put you out of your misery. This Thursday 6pm in Trevor we will be joining up with Bowland for some bingo fun! It’ll be 50p per card, with prizes for a row, corners and full house! Hope to see you all there! Are you interested in Furness and want to know more about how things work within the JCR? Do you have any questions or comments you want to pass on? Or do you just want FREE Pizza? Whatever the reason, head on down to the TV room next Monday for Furness’ General Meeting! This week’s specialist topic is The Simpsons! Have a look at the leaderboard to see where your team stand! Take a look at the Facebook event for more details here. In case you were wondering what the JCR have been getting up to over the last few weeks in their meetings, here’s a copy of the minutes below. This could give you some questions to ask at the General Meeting next Monday! That’s everything for now! See you next week! Happy Monday Furness! Hope everyone has a great week! Today’s the big day! DEADLINE DAY! Don’t forget to hand in your application to the porters today! Interested in representing the college? Think you know your fair share of information? We’ll be holding half an hour trials in Trev today from 12! Do you have any plans for tonight? Well now you do! Head on down to Trev for free entrance to Dalton with every drinks purchase, and the chance to win a pair of tickets to see Basshunter! More information on the Facebook Page here. Furness has spoken… Your chosen film was Pirates of the Caribbean and your chosen charity was Bluebell Wood Children’s Hospice! With the motto of Bluebell Woods children’s Hospice being ‘living with love and laughter’, as a college we are raising funds to help the team create special memories for children, young adults and families who visit. This is a great charity which gives families the chance to relax, take a break and have fun. Come down to our film night, have a few drinks and devour some free popcorn to show your support! More information on the Facebook Page here. It’s that time of term again! The JCR will be selling tickets in Trev 12-4 today! Tickets are £6 and you get a freaking lightsaber with it!! More information on the Facebook Page here. Due to the Big Night Out there isn’t a Pub Quiz this week… but you can use this week off to prep for next week’s specialist round which is Nottingham Forest! This Thursday there’s a social in Trev from 7pm onwards. More information on the Facebook Page here. Interested in contributing to our college magazine? Have any art/photography/writing/poetry/almost anything?! We want to know! Message the Furness Facebook page and we’ll be in touch. We’d love to hear from you! Morning Furness! This week is a busy one so I’ll see you at the other side! This weekend is Valentines Day… for those who have a special someone that’s great! It’s here! Tickets go on sale TODAY in Trev / JCR room at 12pm midday! There’s normally a queue so make sure you head down early to avoid disappointment! For more information check the Facebook page here! Do you like free stuff? Who are we kidding, you’re students, of course you do! Well you’ll be happy to hear that at bingo tonight, with every drink you buy, you’ll get free entrance to Dalton Rooms! And you’ll be in with a chance of winning some drinks vouchers to use at Daltons! Reminder: Applications are due Monday 22nd February! If you have lost yours or didn’t attend the talk (don’t worry we won’t tell!) then we will be posting a digital copy of the form online on Friday. If you want one earlier or have any questions feel free to message Tom Coleman (VP Welfare). Have something written in another language! On Wednesday LUSU are holding World at Lancaster event in Alex Square and Furness have a stall! We are going to have people who can write in different alphabets (other than the English one) to write personalised messages. As it’s valentines day on Sunday, you can even get an ‘I Love You’ message written for your valentine! Thanks to all the responses on the Pub Quiz, we have narrowed it down to your 2 favourite charities; Bluebell Wood Children’s Hospice and Guide Dogs UK. To decide which charity you want donations for the movie night to go to, we have released a poll, so get voting! 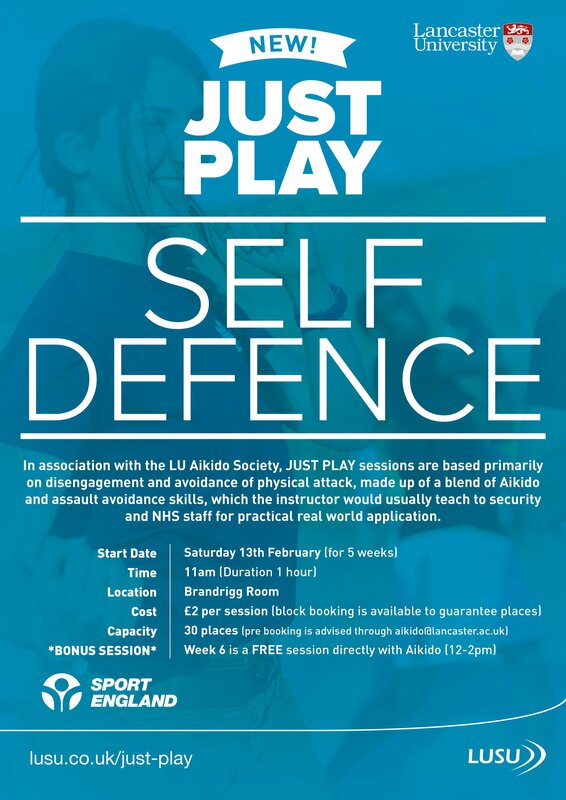 On Saturday Just Play are doing Self Defence classes at 11am, and will be doing sessions for the next 5 weeks! There are only 30 places and this is university wide so better book your space quick! See the poster below for more details. This week’s specialist round is Lord of the Rings, for more information check out the facebook event here! Have a look at the leaderboard so far to see where your team is! We now have a Facebook page completely dedicated to all sporting events in Furness! Give it a cheeky like to keep up to date! Just Play – Week 6 – Free for Furness! Are you interested in playing sport but are either not in a team or don’t want to pay for gym membership? Well week 6 is your lucky week! We have arranged for Furness students to be able to attend Just Play sports for FREE! So if it’s just for a bit of fun, or even a warm up for Patriots or even Roses then give it a go! That’s all for now! Hope that everyone has a great week! Happy Monday Furness, we hope that everyone had a great weekend! Thank you everyone who attended Winter Ball! We had a great time, we hope you did too! We have posted some photos on the Facebook Album so check them out and give them a cheeky like! This week’s specialist round is Buffy The Vampire Slayer! Head down to Trev at the normal time of 7:30 for your chance to win the cash prize! More information on the Facebook Event. Have you thought about being a Rep next year? Well there is a talk on Friday at 6pm in Cavendish LT where you can learn about the role and the application process. More information on the Facebook Event. Next week is Lancaster Award Week and we are holding a Lancaster Award Development Session on Tuesday week 14, 1pm-3pm. Look out for more details to come on Facebook! Who’s feeling a bit stressed, or know’s they will be when exams come around? Well to help the College Wellbeing Officers have organised stress management workshops to help! No need to sign up, just come to the Quiet Study Room in Graduate College Social Hub (room on your left as you enter the building) on Monday 1st February at 18:00 or Fylde College Common Room on Wednesday 24th February at 14:00! Still looking for accommodation next year? Don’t worry, we’ve got you covered! There is a Homes in the City Open Day on Wednesday 27th January in the Furness Foyer 2:30 – 5:00, where you can meet approved landlords, get housing advice and book tours of accommodation in the city! There will be healthy eating demonstrations at the farmers market each week every Thursday! That’s all for now, hope you have a great week! Welcome back! We hope that everyone had a great Christmas and New Year! Just a quick introduction, we are Grace and Mike and are your new Media & Comms officers and so we have taken over the prestigious job of writing Bev’s Hills from Heather and James, hopefully we will keep up their good work! We are going to introduce the new JCR fully next week but in the mean time you can see who we are here! Unfortunately Storm Desmond ruined all the fun at the end of term, but do not fear, we have plenty of events to keep you entertained back in Lancaster! To start with, Furness College is holding our first EVER Refreshers events! All of the information is available on the Facebook Page – including our famous Pub Quiz, (this week’s specialist theme is Star Wars, Episodes I-VI), and a welcome event for new students with FREE TEA & CAKE, designed to provide lots of crucial information about independent living and information on Lancaster/The University. To round up the first week back, our final event is our Posh vs Ghetto Bar Crawl on the Friday, with plenty of drinks deals and offers to be announced this week! The next big event after that is our re-scheduled Winter Ball! Because of unforeseen circumstances (stupid Desmond) we couldn’t hold it last term. The new date is Tuesday 19th January and you can find all the info on the Facebook Page. If you can’t make the new date then refunds are available on Monday 11th between 12-2 in Trev. Please please please message the Facebook page in advance so we can have the money ready for you. And if you can make the new date and don’t have a ticket, send us a message and we will add you to the waiting list! Who here likes to play pool?! 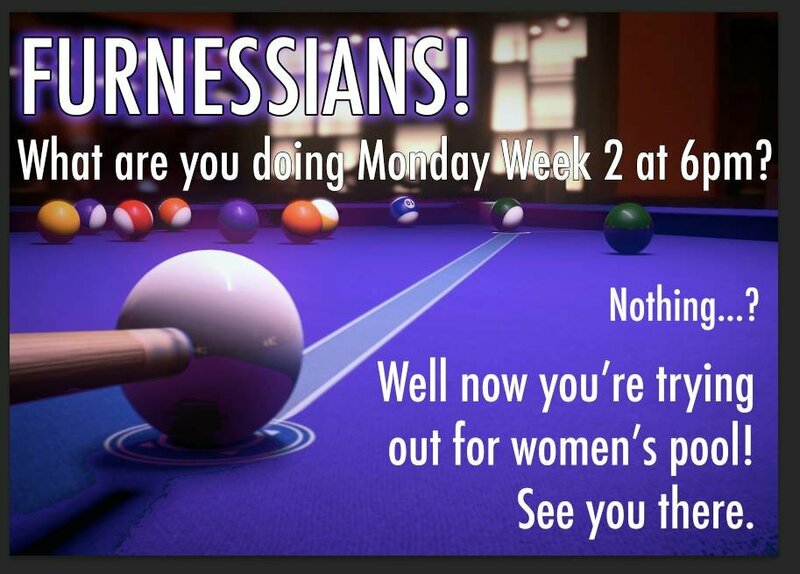 Well if you do, the Women’s Pool team are having re-trials, Monday Week 2, 6pm in the JCR Room. Finally – who doesn’t want some extra money? Well you’re in luck! LUSU are holding a big review (takes about 10 minutes) where there’s 1 prize of £150 and 10 prizes of £25! You can find it here!